I’ve recently upgraded my home lab ESXi hosts to ESXi 6.0 Update 2 (6.0u2). 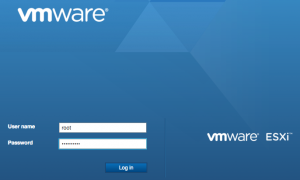 One of the features added is the VMware Host Client – an HTML5 standalone web interface for managing an ESXi host. This has been available as a VMware Labs “Fling” for a while but it’s now part of the default installation. It allows you to manage a standalone ESXi server without needing vCenter or the Windows-only vSphere Client (aka the C# client). A bit of web searching brought me to a blog article by the ever-comprehensive William Lam about an issue with the original Fling when installing on a host which has been upgraded from ESXi 5.5 or earlier. Part of the Reverse HTTP Proxy config does not get updated during the upgrade, leaving the new UI broken. I have a small Home Lab for vSphere, based on two Intel NUC hosts running ESXi and an HP Microserver running FreeNAS, presenting datastores as iSCSI LUNs to the hosts. The vCenter is a vCenter Server Appliance (VCSA) running on one of the ESXi hosts. The initial setup was fairly straightforward and you can find plenty of other people who have done similar things. One of the difficulties/limitations of using the Intel NUC is that each machine has a singe NIC. That makes creating a Distributed Virtual Switch (DvS) quite difficult as when migrating the host running vCenter to the DvS, the vCenter loses contact with the host and rolls back the migration. I figured I could live with standard switches, and if I really needed to use DvS I could use nested ESXi with multiple virtual NICs. Recently I discovered an excellent blog article by Larus Hjartarson titled “vCenter & Distributed vSwitch on two ESXi hosts with a single NIC“. This suggests a workaround for the migration issue mentioned above. Create the DvS on the host that doesn’t run vCenter. Move that ESXi host to the Distributed vSwitch. Create VM traffic portgroups. Clone the vCenter VM and place it on the ESXi host that doesn’t run the vCenter VM. Turn off the original vCenter. Move the other host to the Distributed switch. http://kb.vmware.com/kb/2012451 – basically you edit the /etc/udev/rules.d/70-persistent-net.rules file so that the new MAC address is associated with eth0. If you’re using iSCSI-based storage, you cannot migrate a host to the DvS until you remove the vmknic from the software iSCSI adapter, which means having no iSCSI-stored VMs running on the host at the time. You can’t vMotion the VMs to the other host as they’re on a standard vSwitch and the other host is on a DvS. Even if you leave the old standard vSwitch in place on the other host, vMotion will still abort as it sees the old portgroup as a “virtual intranet” (i.e. no uplinks). So you have to shut down the VMs to move them. That’s when it becomes important to either have two DNS servers, DNS served outside your VMware setup or your host names in the vCenter hosts file. VMware do have an KnowledgeBase article on the “virtual intranet” problem which has a workaround based on editing the vCenter config file but I have not tried that. I hope that information proves useful to anyone else using single-NIC hosts for a Home Lab. Obviously I wouldn’t recommend doing any of this on a production environment, but then I’d hope that a production environment wouldn’t be using single-NIC hosts anyway! We recently moved our ISO store from a legacy NFS server to our main NFS filer. The first task was copying the actual files, which can be done via any machine that has both datastores mounted (with read-write access to the destination store). The more significant job is reconfiguring the VMs to use the copies of the ISOs in the new datastore. The biggest caveat with this is that it assumes that the source and destination stores have the same structure, but it wouldn’t be difficult to amend it to change the destination path slightly. I’ve recently reported a couple of annoying bugs to VMware. Both have been around for a long time, almost certainly since the days of Virtual Center 2.0, maybe even earlier. If a VM has nothing in the “Notes” annotation, vCenter displays the “Notes” from the previously selected VM instead. The problem only occurs if the VM has never had any Notes annotation. If you set one and then remove it, it shows the blank note correctly. **UPDATE** – This appears to be fixed in 4.1 U1 – it only seems to affect VMs which were deployed without notes under VirtualCenter 2.x. When deploying a VM from a template, the Tasks & Events history doesn’t correctly name the template from which the VM was deployed. As you can see in the example image, vCenter lists the deployed VM name instead of the template. ** UPDATE ** VMware have acknowledged this as a bug but it will not be fixed until vSphere 5, later this year. And there’s a cosmetic thing which winds me up. I haven’t reported it as a bug but if anyone from VMware reads this, maybe they can have a word. It’s really trivial…. “Send Ctrl-Alt-del“. What has “del” done to deprive it of a capital “D”? VMware Fusion also has a “Send Ctrl-Alt-Del” menu option but it gets the capitalisation right. I can only offer this as proof that Macs are better than PCs… or something. vSphere HA slot sizes are used to calculate the number of VMs that can be powered on in an HA cluster with “Host failures cluster tolerates” selected. The slots size is calculated based on the size of reservations on the VMs in the cluster. HA Admission Control then prevents new VMs being powered on if it would not leave any slots available should a host fail. The slot size for a cluster can be seen by going to the Summary Page for the cluster and clicking the “Advanced Runtime Info” link in the HA box. If none of the VMs have CPU or RAM reservations, a default of 256MHz and 0GB is used. The slots per host is derived by taking the total available CPU/RAM for the host and dividing by the slot size. Some CPU is reserved for the system so it will usually be a little lower than the full amount. So a host with 2xquad-core 2.4GHz CPUs (total 19.2GHz) and no VM CPU or RAM reservations has 73 slots and will only allow 73 VMs to be powered on if the cluster has two hosts and is set to protect against a single host failure. Obviously this allows a very minimal amount of resource for each VM, so either reservations should be set for each VM, or slots size can be manually adjusted (see the VMware vSphere Availability Guide (pdf) for full details). Note that the slot size is used for admission control calculations only. It has no direct effect on the resources available to VMs should an HA event occur. There is a VMware Knowledgebase article (1010594) which has some details of the difference in VI3 and vSphere 4.x. We’ve had this error on ESX 3.5 and 4.0 hosts, both ESX and ESXi. When trying to add a new NFS datastore we get the above error message, both in the vSphere Client and when using the command-line tools. Logging on to the Service Console on an affected host, “esxcfg-nas -l” also results in the same error. 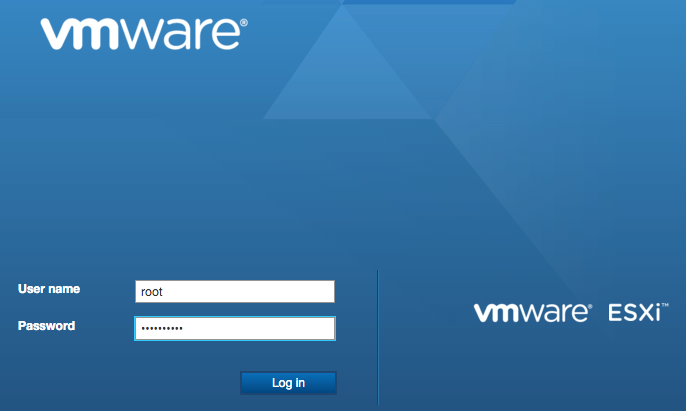 The cause is invalid entries in the /etc/vmware/esx.conf file. Fortunately, it seems to be possible to remove the bad entries and the host then starts working properly without a reboot. As I mention above, fixing it on ESX isn’t too hard, just edit /etc/vmware/esx.conf using nano or vi as root, being careful not to affect any other lines. On ESXi, it’s a little more tricky as you can’t readily log on and edit files without enabling Technical Support mode. It is, however, possible to edit esx.conf via the Remote CLI (Linux or Windows) or using the vMA. Below are some example commands which grabs the esx.conf file, edit it using ‘sed’, and then put the altered file back on the host. The ‘sed’ command will probably need to change for you, depending on what the invalid lines look like. You can just use nano or vi on Linux or the vMA to do the edit, but if you’re using Windows you may find that Notepad and Wordpad either don’t display the file clearly or convert the line endings from Unix format to DOS. Using the free VIM for Windows (http://www.vim.org/download.php) will let you keep the file in the same format. After making those changes, it was possible to add NFS datastores as normal. In large vSphere environments it can be very tedious to add multiple NFS datastores to lots of hosts. PowerCLI comes to the rescue as usual. I needed to add some datastores to all the clustered hosts in a single datacenter, but to skip our non-clustered standalone hosts which are used for backups. $datacenter = Read-Host -Prompt "Datacenter name"
552 days, 14 hrs and 58 min.